LEO Apricot Sour on the deck! Four weeks ago I brewed three beers from one mash – the Low Earth Orbit (LEO) Apricot Sour is the second beer from that mash. This is a kettle-soured beer, fermented with Kveik yeast and Brettanomyces, and packaged with apricot extract to provide a complementary fruit note. This Berliner Weisse style beer is low alcohol (~3.2% ABV), low bitterness (~3 IBU), modestly soured fruit beer. 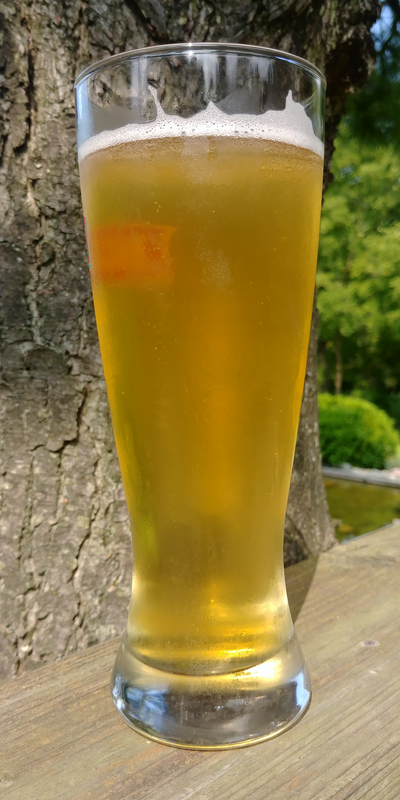 It was brewed to be a light, crisp and refreshing beer to end the summer on…and did it deliver! Appearance: The beer has a dark-straw to light-copper coloured body with a small amount of haze. It pours with a modest white head that sticks around for most of the pint. Aroma: Up-front is a fresh apricot character alongside some lactic acid notes. Behind this is a subtle bread-like malt character. Flavour: This is where this beer shines. Apricot is up-front and centre in this beer. It is the first think I taste in this beer, and is a major flavour note. But it is not so overpowering as to make the beer a single-toned thing. Alongside the apricot is a medium lactic sourness and some additional fruit notes from the Simonaitis kveik yeast. As these fruit-forward notes fade, a bread-like malt character and subtle earthy funk emerge – a product of the malt bill and Brettanomyces. The beer itself is crisp, light, effervescent and refreshing. The after taste is a nice fruit & lactic note which fades. Mouthfeel: The beer is light bodied and crisp – but not so light as to be watery. The acid and high carbonation provide a bit of an acid prickle on the tongue and palate. Overall, the mouthfeel is very whetting, thirst-quenching and very drinkable. Overall: A fantastic quick sour – more complex than most quick-sours, but still simple and light enough to be a great summer thirst quencher. The fruit, yeast, hops and malt come together to make a wonder apricot sour. It is refreshing, thirst-quenching, complex enough to be a sipper, but light enough to be downed by the litre on hot summer days. This is definitely a recipe I will revisit in the future!